Irish horror film Nails (2017) is a slice of supernatural hospital horrors, opening with fit-mother Dana (Shauna MacDonald, The Descent) beginning her morning ritual pretty much the exact same opposite as mine, with a bit of yoga and then out for a morning run. My morning begin with a French press of French roast and then a commute to work and not much more, but this woman is very fit, and proving that the fit don't actually fair much better than the rest of us lazy slob she gets wiped out by a car while on her run and ends up in the hospital with crippling injuries. Paralyzed from the waist down and unable to breath on her own, she is laid up and recovering for a prolonged period of time, bed-ridden and weak. While there recovering she develops a friendly relationship with her orderly Trevor (Ross Noble), and is occasionally visited by her husband and teenage daughter. While she is unable to speak because of the breathing tube she is able to communicates through a laptop with a text to voice feature. One night Dana feels a presence in her room, she calls out (with the aid of her PC) for it to identify itslef but receives no answer, but we see a demonic presence in the room with her lurking in the shadows just out of sight. Before too long the long-finger-nailed apparition is tearing at her flesh when she is left alone in the room. She reports it to the hospital staff but no ones seems to believe her, attributing it to her state of mind following the traumatic injuries, even her husband and daughter have trouble grappling with the idea of a skin-shredding phantom of the hospital, but just the same the nightly attacks persist, eventually her husband ends up installing a security video system from which she can view her surrounding on her ever-present laptop, offering a smattering of found footage style creepiness. MacDonald turns in a fine performance as the paralyzed woman trapped within her own body and unable to fend for herself, it's a deeply psychological performance, her inner struggle in painful to endure as the usually strong woman finds her self weak and without resistance to the evil force within the hospital. 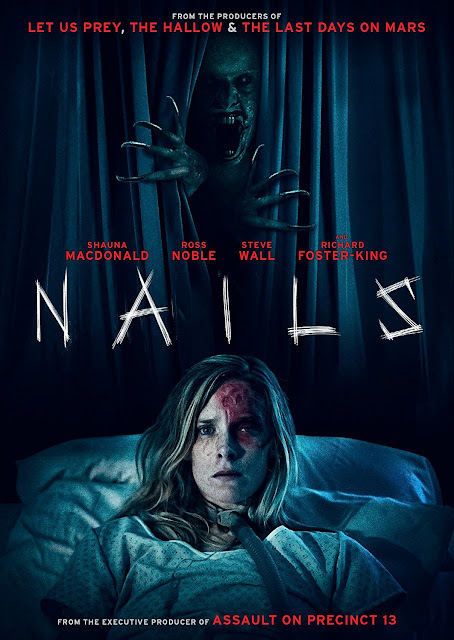 The creature itself gets a bit of backstory involving a former patient/orderly with a history of self harm and a collection of other patient's nail-clippings, it doesn't go too deep with it, but just enough to plant some narrative threads that don't really go anywhere. Aside from the skin-shredding hauntings we also get some family drama, her husband seems to have a side piece while she's laid up at the hospital, which causes some tension between the two, real or imagined is debatable, but it's real to her. The special effects for this one are a bit too digital, the gore is near non-existent, in it's place we get some surprisingly bloodless skin lacerations, but the film succeeds in creating a sense of isolation and helplessness, wrapped in claustrophobia with some decent hospital horror atmosphere. Not a high recommend, but a damn decent Irish horror entry that shouldn't be ignored.